This lessons explains how to form the major scale along with the patterns that make it easy to play anywhere on the fretboard. You will need to know a few things before continuing. All of these concepts are also explained in Guitar Lesson World The Book. You will need to understand the difference between a whole step (tone) and a half step (semitone). You can learn more about this in my intervals lesson. You should know how to find any note on the fretboard. You can learn more in my Learning the Fretboard lesson. You should have a working knowledge of notation and tablature. You can learn more about that in my notation lesson. You should be able to use fretboard diagrams. 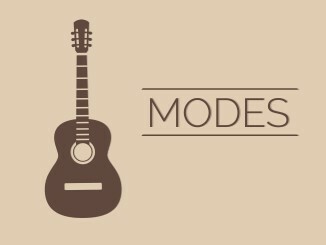 You can learn more about them in my guitar diagrams lesson. A scale is simply a set of notes arranged in order of pitch. They are named by the first note of the sequence. This is called the root note. Scales can ascend in pitch or descend in pitch. Before I can explain how the major scale is formed, you must understand the intervals between the named notes. There are whole steps between A-B, C-D, D-E, F-G, G-A and half steps between B-C, E-F.
Accidentals allow for more flexibility with these notes. Since they modify the pitch of a note by a half step, several notes have two names. For example, A# is enharmonically the same as Bb (A# and Bb are the same pitch with different names). Later, I will show you the rules that govern which one to use. The major scale is an important scale. It contains a repeating pattern of seven notes at specified intervals of whole and half steps. Numbers are often used to designate the degree of the scale in the repeating pattern. The degrees are given in numbers or roman numerals (as shown). Each major scale is related to a major key. For example, the key of C (major) corresponds to the C Major Scale. When indicating a major key, you can omit the word major. It is assumed. The key of C is the simplest key to learn the scale because it contains no accidentals (no sharps or flats). You can play the C Major Scale below in open position. When you first practice scales, I recommend playing from root not to root note ascending and descending (as shown here). The notes, in order, are C – D – E – F – G – A -B – C – B -A -G -F – E – D – C.
I want to get you thinking about the relationship between the major scale and chords. The notes of a chord can be derived from the major scale. Start at a degree and play every other note. For example, you can form a C Major chord by playing C-E-G. Similarly, you can form a D minor chord, by playing D-F-A. The C chord is the I chord. The D chord is the ii chord. The degrees of the scale (roman numerals) are used to specify chord progressions. A ii-V-I means you would play a D minor, G Major, C Major in order. Also, notice that lower-case numerals indicate minor chords. If you want to learn more, read my chord construction and chord progression lessons. I want to show you how to form an F Major scale because it uses an accidental. Scales are always spelled in alphabetic note order. So the F Major scale would be spelled as F-G-A-B-C-D-E. The problem is that this is not a major scale. It is actually the Lydian Mode. To make it a major scale, we need to fix the intervals with accidentals. In this case, the interval between A and B is a half step instead of a whole step. Therefore, we need to flat the B to make it a half step. Now you have F-G-A-Bb-C-D-E, the F Major Scale. It is important that you never use the same letter twice. Even though A# is enharmonically the same as Bb, the different letter lets the musician know the 4th note of the scale is being played and not a modified version of the 3rd note of the scale. This convention is helpful when musicians communicate. Another way to form the scale is to learn/memorize the number of sharps and flats in the key. For example, the Key of F is known to have one flat, Bb. Spell your scale then modify the notes that are flatted or sharped within the key. To make sure you know how to form the scale, I provided a step-by-step. Start with the root note for the key you are using. In the key of F, your root is F.
Follow the interval formula for a major scale (W-W-H-W-W-W-H). A whole step up from F is G.
A whole step up from G is A. A half step up from A is Bb. To maintain a half step, we must use accidentals. In this case it is a flat. A whole step up from Bb is C.
A whole step up from C is D.
A whole step up from D is E.
A half step up from E is F. E to F is naturally a half step. You can also play the scale on a string. I think this is one of the best ways to learn the step-pattern. Play the pattern below, then repeat it from frets 13 to the end of your fretboard if you have access to them. Play it ascending and descending. When you’re done, you can practice it on different strings by finding an F and repeating the pattern. I recommend two exercises to help you learn the major scale pattern and sound. It is important that you hear the sound of the scale. I often recommend playing a Major chord before playing this scale. It helps you hear the scale. For example, play a C Major chord then play a C Major scale. Exercise 1: Write the notes of all the major scales. You can check yourself (or cheat) with my list of major scale notes. Exercise 2: For every key, play the major scale on each individual string. Say the notes as you play them. Sing them if you can. Pay attention to the sound and the steps. This is useful because you will sometimes want to move up or down the neck with a scale and this exercise helps you learn one way to do that. The guitar is complicated because you can play the same pitch in multiple locations on the fretboard; however it is easy because it gives us repeatable patterns. This section will teach you several major scale patterns. There are three ways to learn scales on the guitar: Notes, Intervals, and Patterns. You already learned the major scale in two ways, by notes and intervals. This section will explore the third, which is probably the most fun. Single-octave patterns are the simplest patterns to learn. They can be chained together to form multi-octave patterns, and they allow you to play the scale anywhere on the fretboard. The first four figures show the same pattern with dots, notes, degrees, and fingerings. The notation below shows how you can play the single-octave pattern. Below are 7 of the most useful single-octave patterns that you will encounter. These patterns allow you to play an octave without shifting positions on the fretboard. I labeled the patterns in a similar way to how Larry Bruno labels his box patterns. I use two numbers, the first is the string number of the lowest root note. The second is the finger that should play that root note. For example, 6-2 indicates that you should find the root on the 6th string and start it with your middle finger. 6-4 means that you should start with your pinky finger instead. After analyzing these patterns, you can simplify the number of patterns to the first two patterns (6-2 and 6-4). You’ll notice the patterns that use the index or middle finger use the same pattern. The patterns that use the pinky finger use the same finger. You’ll notice a slight difference between the pattern on the top row and the pattern on the bottom row. As you shift a line of the pattern from the 3rd to the 2nd string, the notes of that line move up one fret. This rule applies to all patterns in standard tuning. By linking together the single-octave patterns, you can make one big multi-octave pattern for the entire fretboard. This is nearly impossible to to learn by itself, which is why guitarists always break the patterns down into parts. Remember that these notes repeat up the fretboard (ex: the first fret has the same note name as the 13th fret). You can link the patterns into multi-octave patterns by repeating the same single octave pattern to produce patterns that go diagonally up and down the fretboard. Additionally, you can alternate them to obtain box patterns. The 6-2 Box Pattern (below) is a combination of the 6-2 single-octave pattern and the 4-4 single-octave pattern. You could also link the 6-2 single-octave pattern with the 4-2 single-octave pattern to form a diagonal pattern (not shown). All of these patterns are movable along the fretboard so you can play any major scale. Simply move the pattern so the root note (black dot) is on the proper fret. You’ll notice that the patterns overlap so you can connect them all. Usually they overlap by 2 frets. In theory, you could learn 3 patterns and cover the entire fretboard. I provide all five because some are easier to play than others. You will notice that I have included a chord form name. Each pattern contains the notes of a CAGED chord form. Can you see the chords that you already know? You can use this knowledge to find the chord tones within the scale. Chord tones are often used as an improvisational technique. Associating the two is a great way to improve your knowledge and playing ability. If you’re starting out, I would learn the 6-2 and 5-2 box patterns and the 3-1 single-octave pattern. That way, you’ll know a pattern for chords rooted on the 5th and 6th string. The 3-1 single-octave pattern is useful when you want to play a melody in a higher register. It also fits nicely under your fingers. Learning the major scale is a big deal. I recommend the following ordered approach to practicing it. Learn how to form the major scale notes. Learn the single-octave patterns first. Learn them from the root notes of the chords that you know. This simplifies your effort in finding the scale. After you’re playing single-octave patterns, you’ll want to extend them. Start by playing an octave higher (12 frets up). Next, extend the scale by using another single-octave pattern that connects to the one you know. Learn how to play the major scale along a single string. This will help you extend the scales even more. Next, you’ll want to explore the box patterns. You can find your single-octave patterns within the box patterns. Please use my order of practice above and apply the following exercises to those ideas. Remember to say the notes as you play them. 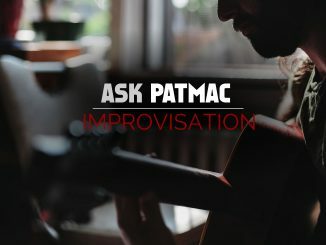 Knowing the notes within the pattern will help you avoid ruts and plateaus in your playing (trust me, I’ve been there). This is one reason why I associate the chords with the box patterns. Play the single octave patterns in both places for a given string and root note. Say the notes as you play them. Form diagonal patterns by playing 6-2 and 4-2, 5-2 and 3-1. Practice alternate picking while playing the patterns. This will help you improve your speed. Use a metronome to play in time properly. Play a single octave pattern. At the end, play the next octave on a single string until you run out of room. Practice ascending and descending. Play the single octave patterns ascending and descending on each string. Start from a chord’s root note at that location. Play a chord then play the box pattern associated with that chord form. Play all 5 box patterns in two locations. Ex: 6-2 Box rooted on the 5th and 17th fret. This is an A major scale pattern. Practice shifting between the box patterns. Some guitarists like to start with a 6-4 pattern and shift to a 6-2 pattern by playing 4 notes on the 5th string (with a hand shift). Try this with other patterns. Shift the box on the string before or after the root note. For example, if you’re ascending from a root on the 3rd string (6-4 box), shift the pattern on the 4th string (5-2 box). If you’re descending from 5-2, shift the pattern on the 2nd string (6-4). Practice alternate picking while playing the patterns. Try connecting the patterns with the same pattern an octave higher. Use the major scale on a single string to connect them. 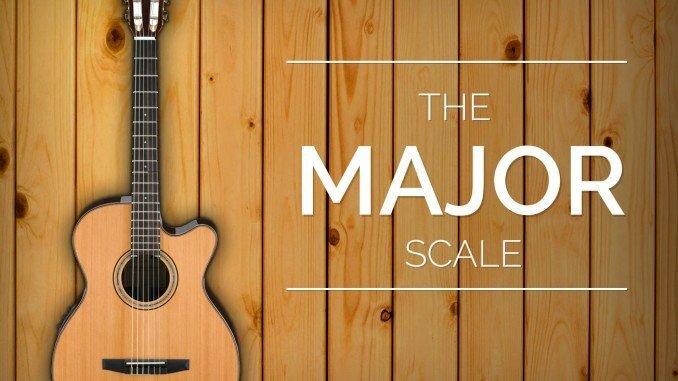 You will want to spend a lot of time on the major scale. It takes a while, I’m not going to lie. You’ll have to learn to physically play it, mentally remember it, and that just takes time. Learn it in pieces. Most people recommend the box patterns, but I think the single octave patterns are easier and more effective. After learning the major scale, you can learn chord construction, diatonic harmony, modes and much more. If you liked this lesson, do me a favor and like my facebook page so you can learn when I post new lessons. If you have questions or feedback, please contact me. I want to help you become a better guitarist. Thanks alot.. This is the first site that has really analysed this theory for me.. Thanks alot.. Am really grateful.. Thank you for your kind words. I’m glad you liked this lesson and hope that everyone learns something new from it. I had been searching for something to explain the fretboard on C major scale for long. Thank you! Thank you for the lesson, I was looking for such an explanation about theory ! Thank you for your kind words. I am glad that I could help! I am familiar with the major scale through rote memorization. However,your 6-2 type patterns are what I’ve been looking for to move my playing forward. Thank you for the insight. I’m glad you found the 6-2 pattern helpful. Good luck with your playing! Amazing lessons! So clear and well-structured. Many thanks. Well constructed article and explained nicely one could understand. Very helpful. Thank you for the kind words! I’m glad you enjoyed the article.